If I publish a 2nd edition of my book, do I need to register the copyright again? Will my ISBNs transfer to my new company if I previously published as a sole proprietor/trader? What do I do if I get a “quality notice” from Amazon alleging that my book has too many errors? Help! If I contract a cover designer to do my cover, am I limited to how many books I can sell before having to pay them again? What is the best way to distribute ARCs to readers? What universal book linking site do you recommend to send readers to their local Amazon site instead of using Amazon.com or .co.uk links every time? I miss the transcripts. They helped me go back to key points in the podcast and focus on them. There was a lot of good material to focus on here. Thank you, Michael and Dan, for answering our questions and offering up so much information. I was struck in particular was what you said about pricing, how it’s very personal. I’d never considered that before. You’re right, certain numbers do seem to resonate. Also pointing the whole “I’m not worth the money!” or “I’m worth double the money!”…thank you, it was oddly therapeutic. (wry grin) It sounds like we ought to be pricing ourselves somewhere within that sweet range that Michael mentioned. 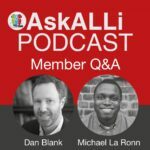 Ask ALLi Members Q & A, and must say, I really enjoyed it. I have already decided to join ALLi, and the podcast was just another positive inducement. Thanks for much for the information provided, and for the thoughtful way it was delivered. I am loving all things ALLi.